The removal of maxillary teeth requires the use of instruments designed for single-rooted teeth and for teeth . with three roots. The maxillary incisors, canine teeth,and. premolar teeth are all considered to be single-rooted teeth. The maxillary first premolar frequently has a bifurcated root, but because this occurs in the apical one third, it has no influence on the design of the forceps.The maxillary molars are usually trifurcated and therefore require extractien forceps, which will adapt to that configuration. The single-rooted maxillary teeth are usually removed with maxillary universal forceps, usually no. 150 (Fig. 6-47). The no. 1SO forceps are slightly curved when viewed from the side and are essentially straight when viewed from above. The beaks of the forceps ‘curve to meet only at the tip. The slight curve of the no. 150 allows the operator to reach not only the incisors, but also the bicuspids in a comfortable fashion. The beak of the no. 150 forceps has been modified slightly to form the no. 150A forceps (Fig. 6-48). The no. 150A is useful for the maxillary premolar teeth and should not be used for the incisors, because their adaptation to the roots of the incisors is poor. In addition to the no. 150 forceps, straight forceps are also available. The no. 1 (Fig. 6-49), which can be used for maxillary incisors and canines, are slightly easier to use than the no. 150 for incisors. The maxillary molar teeth are three-rooted teeth with a single palatal root and a buccal bifurcation. Therefore forceps that are adapted to fit the maxillary molars must have a smooth, concave surface for the palatal “root and a beak with a pointed design that will fit into the buccal bifurcation on the buccal beak. This requires that the .. molar forceps come in pairs: a left and a right. Additionally, the molar forceps should be offset so that the operator can reach the posterior aspect of the mouth and remain hi the correct position: The most commonly used molar forceps are the no. 53 right and left (Fig. 6-50). These forceps are designed to fit anatomically around the palatal beak, and the pointed buccal beak fits into the buccal bifurcation. the beak is offset to allow for good positioning. A design variation is shown in the’ no. 88 right and left .forceps, which have a longer, more a”ccentuated, pointed beak formation (Fig, 6-51). 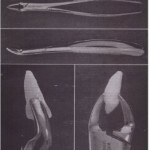 These forceps are known as upper cowhorn forceps. They are particularly useful for maxillary molars whose crowns are severely decayed. The sharply pointed beaks may-reach deeper into the trifurcation to sound dentin. The major disadvantage is that they crush alveolar bone, and when used on intact teeth without due caution, fracture of large amounts of buccal alveolar bone may occur. On occasion, maxillary second molars and erupted third molars have a single conically shaped root. In this situation, forceps with broad, smooth beaks that are’ offset from the handle can be useful.·The no. 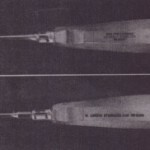 210S forceps exemplify this design (Fig. 6-52). Another design variation is shown in the offset molar forceps with. very narrow beaks. These are used primarily to remove broken maxillary molar roots but can be used for removal of narrow premolars and for lower incisors. These forceps, the . no. 286, are also known as root tip forceps (Fig. 6-53). A smaller version of the no. 150, the no. 150S, is useful for removing primary teeth (Fig: 6-54). These adapt well to all maxillary primary teeth and can be used as universal primary tooth forceps.